CRB’s Rod Drying Tent is a simple yet effective solution that prevents debris from clinging to the curing epoxy. 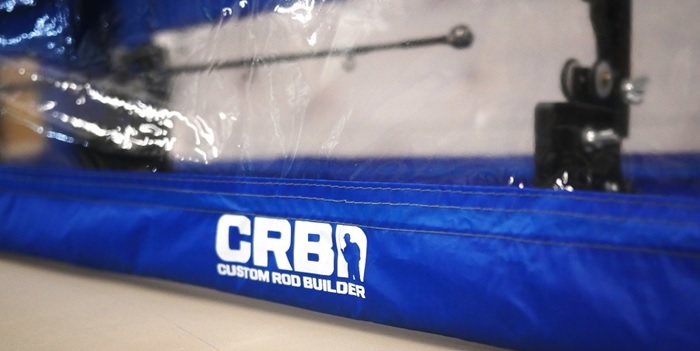 Easy to assemble and even easier to use, CRB’s Rod Drying Tent sits directly over your custom rod as it cures then breaks down to fit into a portable carrying bag. 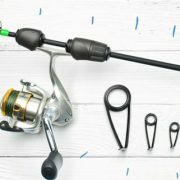 Some lucky rod builders have the luxury of a pristine work station dedicated solely to the creation of custom fishing rods, but others often find themselves hunkered over a custom rod build in more realistic settings such as their garage or shed. 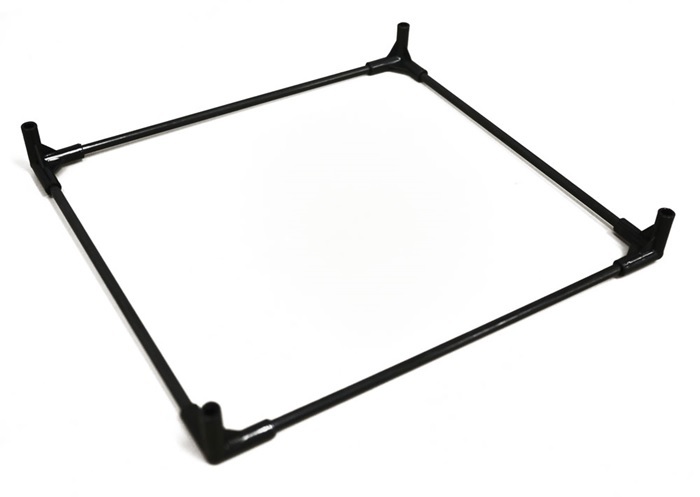 If the environment surrounding your rod build is also home to things like bugs, cats, or clutter, then CRB’s Rod Drying Tent will work wonders in preventing those pesky contaminants from penetrating your drying rod’s epoxy. 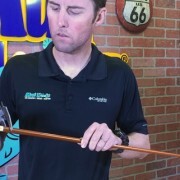 A total of 110 inches in length, the CRB Drying Tent encompasses a rod of up to 9 feet to protect its epoxy finish in its most critical drying stage. 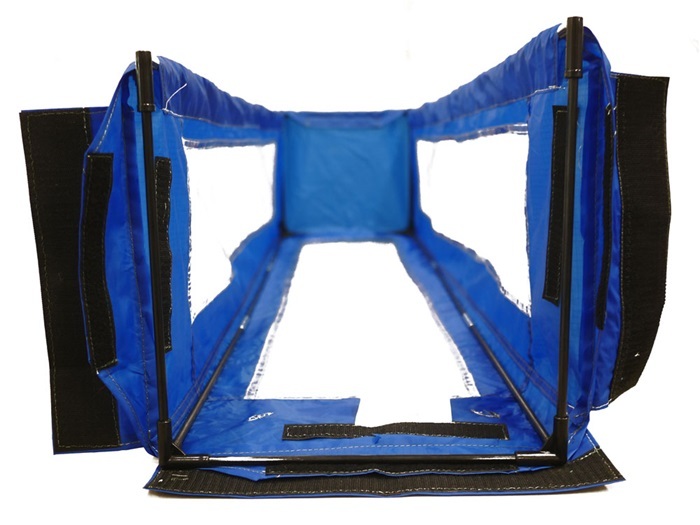 The drying tent supplies a controlled environment so that your rod build can dry safely within the enclosed tent while the addition of 6 conveniently placed viewing windows allows you to keep an eye on any problem areas. 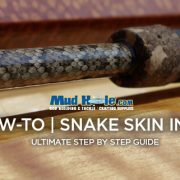 Occasionally, rod builds will require more epoxy or adjustments to guides before the rod dries completely and with these strategically placed windows, you can easily monitor for such conditions. 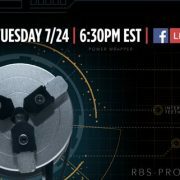 Keeping the custom fishing rod accessible for you while impenetrable for your work station’s outside debris, the CRB Tent Drying System is truly a life saver in any work environment. As usual, CRB is always thinking about investment protection, and the rod drying tent is no exception! 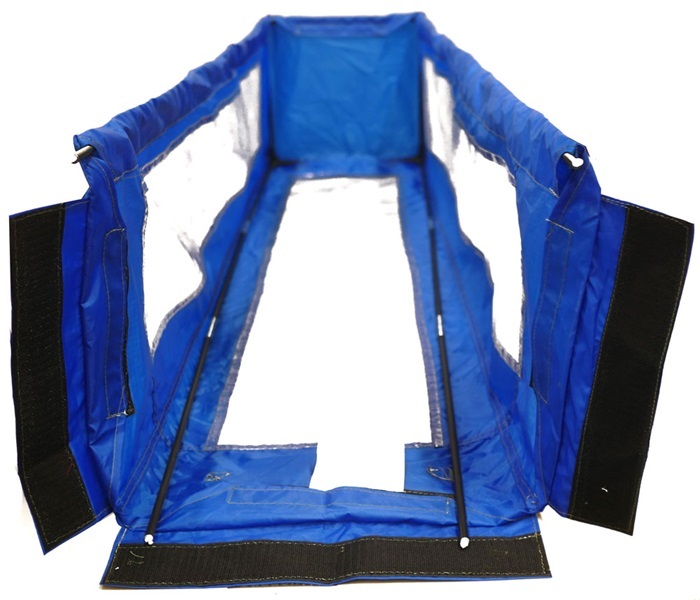 The simple design uses a flame resistant ripstop tent shell featuring pre-aligned Velcro fastening strips, and an infrastructure built by tent poles along with vertical support and horizontal stabilizer beams to ensure a quick and secure construction. Rod builders can effortlessly build, or break down the entire 9-foot tent in minutes. Perfectly portable, the Rod Drying Tent breaks down from over 9 feet to just 2 feet that slides into the included carrying bag. First start by assembling the enclosed base of the CRB Drying Tent, this will take 4 Three-Way Connectors, 2 Vertical Support Beams, and 2 Horizontal Stabilizer Beams. Begin by separating the vertical and horizontal beams, the horizontal beams are about 3/4” longer than the vertical beams. Then, piece each beam together with the three-way connectors until you have formed a flat rectangle. The base should be a complete rectangle with three-way connectors in each corner. This flat rectangle is the base of the enclosed end of the CRB Drying Tent. Next, take one of the Ripstop Tent Shells, and using the enclosed end, fasten the base we previously built to the tent shell with the Velcro strip located at the bottom of the tent shell’s enclosed end. 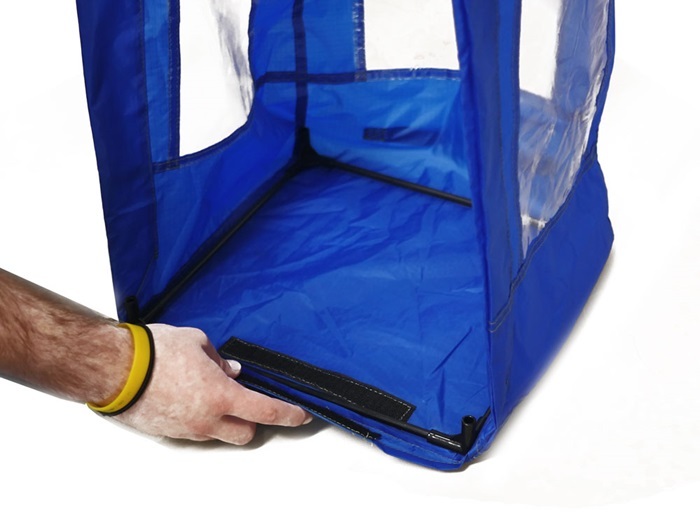 Secure the base to the tent shell with the pre-aligned Velcro strips. This will form one of the outer edges of the CRB Drying Tent. Then, form four of the Collapsible Tent Poles by fitting each section into the next until you have four separate straight poles that will provide the infrastructure of the CRB Drying Tent. Once each tent pole is straight and complete, slide 2 of the tent poles through the sleeve openings along the bottom inside edges of the tent shell. Slide each tent poles through its separate sleeve until both fit into 2 of the base’s 4 three-way connectors located in each corner. Keep in mind the picture is inverted so the bottom edge is facing upwards. We recommend securing the tent poles inside the sleeves at the bottom edges before moving on to the installation of the second 2 tent poles along the tent shell’s top edges. Secure the top 2 tent poles by fitting each one into the two remaining three-way connectors at the enclosed base. Now that the 4 tent poles are secured in the enclosed base, we can build the mid-section base using 2 Vertical Support Beams, 1 Horizontal Stabilizer Beam, 2 Three-Way Connectors, and 2 Ninety-Degree Connectors. Next, place the 2 three-way connectors on the top 2 tent poles so that one opening faces the bottom edge and the other faces the opposite top corner. Connect 1 horizontal stabilizer beam across the top with the three-way connectors to form the ceiling support for the CRB Drying Tent’s mid-section. Then, take the 2 ninety-degree connectors and fit the longer ends over each tent pole emerging from the sleeves along the bottom edges. Once both ninety-degree connectors are in place, use the 2 vertical support beams to connect the bottom corners to the only remaining openings in the top corners. The inverted image displays the bottom facing upwards for easy construction. Thus, the complete the mid-section base should resemble the first base we built except without the second horizontal stabilizer beam along the bottom. With the mid-section base complete, fasten the ripstop tent shell to the mid-section base with the Velcro strips that run along the upper horizontal stabilizer beam and the vertical support beams. 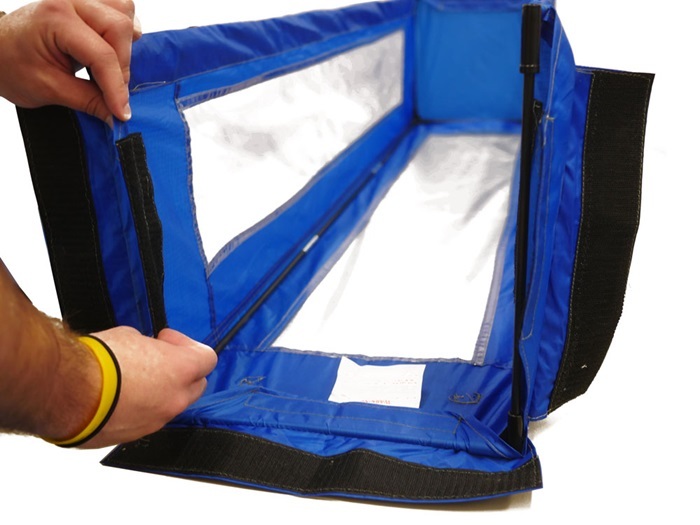 Fasten the Tent Shell to the infrastructure using the pre-aligned Velcro strips. This will tighten and secure the tent over the infrastructure we just completed. The opposite half of the CRB Drying Tent will be assembled the exact same way so repeat steps 1-5 until you have made two identical halves. The only difference between these two tent halves will be the Velcro flaps located over the mid-sections. 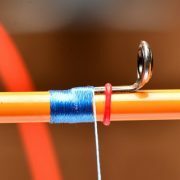 One will have the loop side of Velcro and the opposite will have the hooked side so that both can be conjoined at the mid-sections. Simply Velcro these two tents together in the middle, and you have successfully assembled the CRB Drying Tent.